Welcome back to “Rhetoric Week” at Paste Drink, in which we’re re-tasting every single entry in Diageo’s Orphan Barrel Rhetoric Bourbon line of whiskeys, all the way from the original Rhetoric 20-Year-Old to this year’s newly released (and final) offering of Rhetoric 25-Year-Old. You can see the full slate of tastings published so far by clicking right here. Today, we’re tackling the second entry in the Rhetoric family, the Rhetoric 21-Year-Old, which was first released in 2015. I tasted this sample side by side with Rhetoric 20-Year-Old, and can now report that although the two are similar, they did diverge in some important ways. On the nose, the first thought that sprang to mind while nosing Rhetoric 21 was actually “savory.” There’s a lot of smoke/char in the oak here, which gives a prominent cigar box/tobacco characteristic to the bouquet, but I’m also getting some grassy elements as well. Also of interest: A banana note that I didn’t necessarily pick up in the 20-Year-Old. On the palate, the two diverge more neatly. 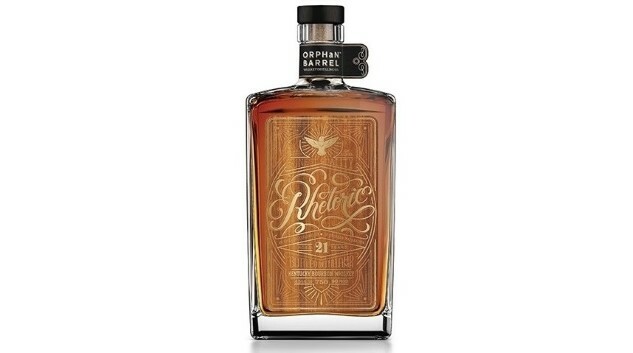 Rhetoric 21 strikes me as a significantly richer, sweeter bourbon than the 20, with a more pronounced suite of molasses/brown sugar characteristics, and much more of a sweet cinnamon note as well, along with some mint. Whereas the 20 possessed more tannic dryness when I sampled it, the balance of assertiveness on the 21 instead tips toward its more rich elements—vanilla, caramel, fruit and spice. In particular, there’s a juicy sweet cherry note here that I’m quite enjoying. This certainly isn’t what one would logically expect as the age of Rhetoric releases ascends—if anything, it would be more sensible to predict bourbons increasingly dominated by the oak. However, as other tasters of the Rhetoric series have observed in the past, it seems as if that steady progression doesn’t necessarily play out. Some years simply stand out as odd ducks. To me, that benefits Rhetoric 21 significantly—I would say I enjoy this measurably more than I did the 20. Will Rhetoric 22-Year-Old continue to ascend the ladder? Or will 21 remain as champion until the end of the cycle? Check back tomorrow for the next entry in Rhetoric Week.